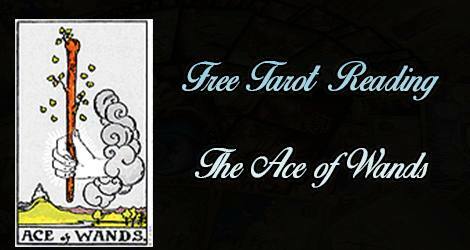 In Tarot, the ace cards represent the seasons of the year, the natural cycles and changes that are always happening. Wands represent the element of fire , symbolizing enthusiasm, new ideas, inspirations and the feelings of anticipation and excitement that come with that. When the Ace of Wands comes up; it means you are feeling a bit antsy or restless, desiring a change or needing to do something new or to express yourself in new ways. The “itch” is there, but perhaps not a clear direction or plan has emerged yet. Take some time to get your ideas out on paper – see what it is you need to feel satisfied or challenged enough at this time. A lot of times when that urge to move is there but no action to back it up, it’s due to not having clear vision. This is a good time to focus on harnessing your inspirations and ideas so that you can change them into well laid out plans. If you are feeling bored or some apathy has set in lately, this card tells you to consciously find a new way to challenge yourself and reawaken your mind. Enthusiasm and inspiration make you feel alive and that happens when you consciously seek new ideas and opportunities. Not only that, the opportunities that you truly desire can flow more easily to you with clear intent.